After Nic’s wonderful build of Kittyhawk's 32nd scale F-86D we now have the export “Sabre dog” is up for review on TMN. 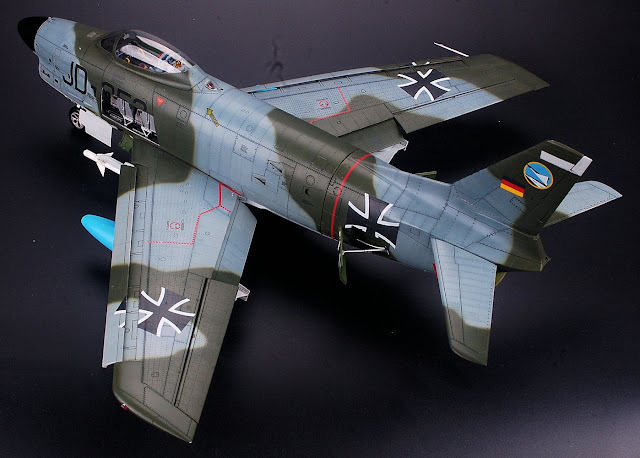 We look at the difference between the “D” and “K” models in real life and some good shots of what’s in the box for this new release in 32nd scale from Kittyhawk. Seven light grey sprues plus one clear sprue; 1 small photo-etched fret. Two decal sheets with markings for five aircraft. 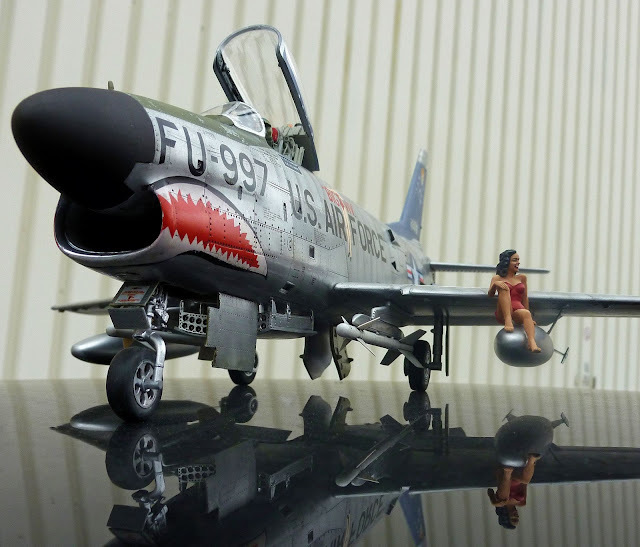 Our man Nic built Kittyhawk’s kit of the F-86D. He has built a few Kittyhawk kits in the past. He said that this was the most improved and the nicest building experience he has had with Kittyhawks kits so far, and this is saying a lot as he liked their kits already. The result of the build was pretty impressive and the finished shots of the built and painted kit are evidence enough. I had not had the chance to see the kit myself as of yet so I was anxious to see how the new “Export version” of the Sabre Dog measured up..
Nic's Kittyhawk 32nd scale "F-86D" model with stowaway on wing he built here on TMN.. I was pretty glad to see a “foreign” F-86 as there are so many colourful schemes from the MANY users all around the world who operated the Sabre Dog. Again there are five different decals included from different countries inside this box and the whispers were that the extended wings, fuselage and other added/ deleted features make this a tempting kit to put on your build list. So what were the changes from the F-86D & “K” versions you ask? 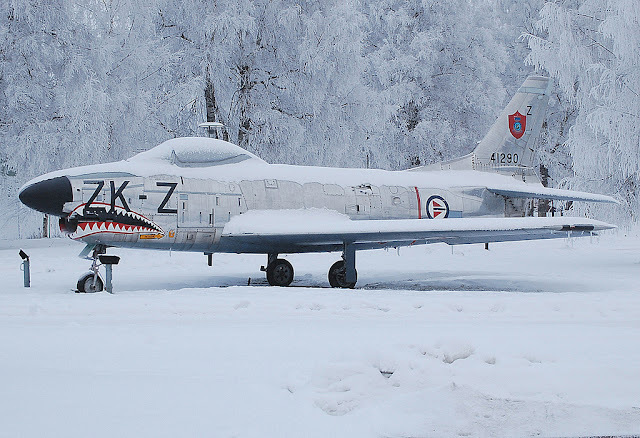 NATO version of F-86D, with a MG-4 fire control system; four 20 mm M24A1 cannon with 132 rounds per gun; APG-37 radar. 120 were built by North American, 221 were assembled by Fiat. 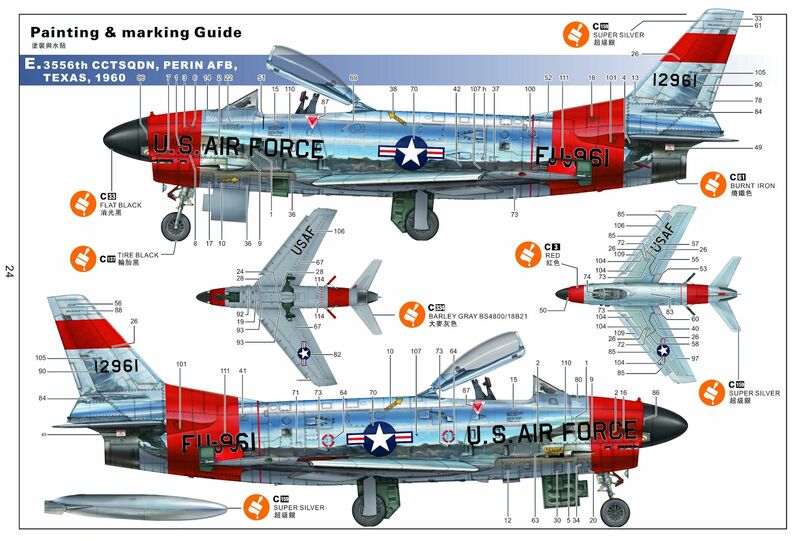 The F-86K was pretty much a simplified F-86D Sabre with some features removed and replaced with others. 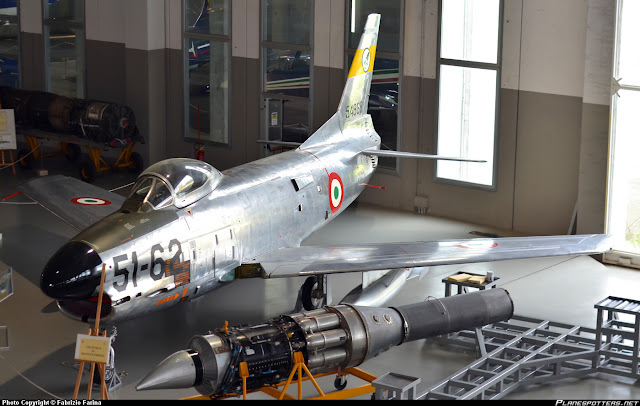 The F-86 “Kilo” was built under license by Fiat in Italy. The main differences being a MG-4 fire control system in place of the then secret Hughes E-4 system and four Mauser 20mm cannon replacing the machine gun and rocket pod tray armament of the F-86D. 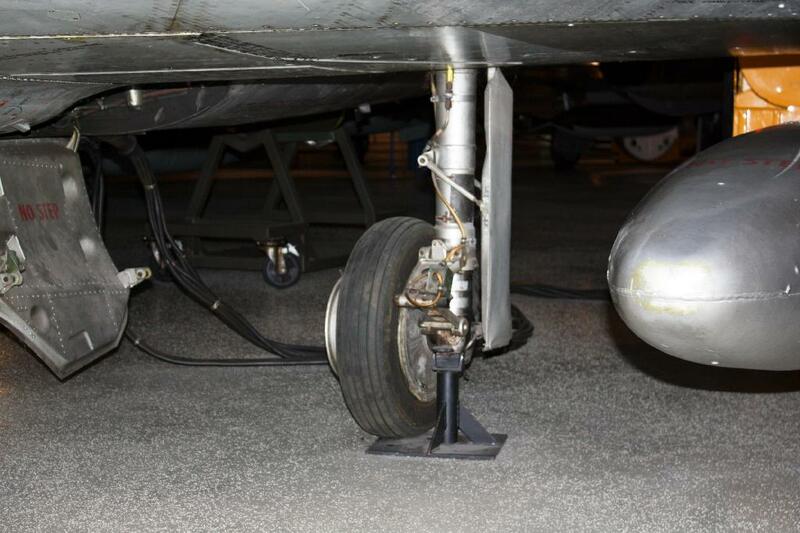 Another difference of significance was the lengthening of the K's fuselage in order to balance the centre of gravity. 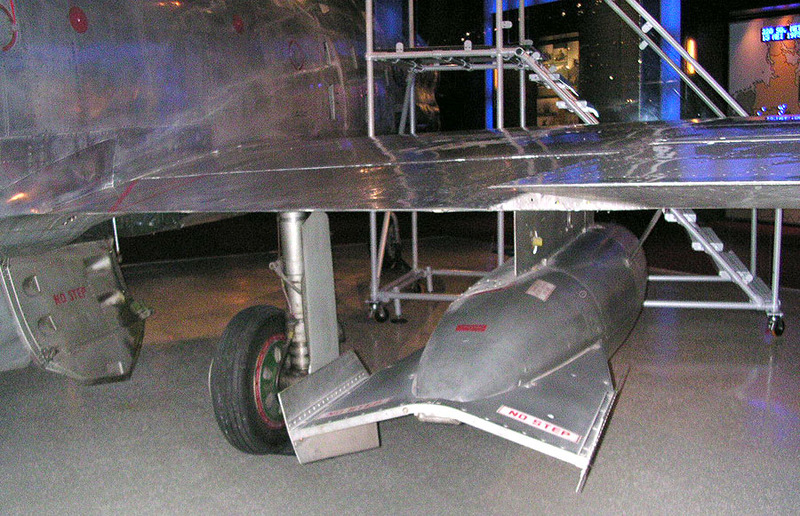 The extra parts were lengthened in two places by two plugs, one behind the cockpit and one on the underside behind the trailing edge of the wing. The wing was also made longer and slats were introduced into the leading edges. 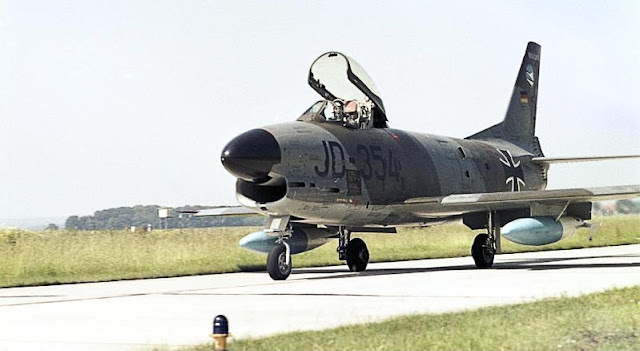 The first F-86Ks were like the F-86Ds equipped with the narrow-chord and long slatted 6-3 wing, the Luftwaffe F-86Ks were Fiat-built aircraft equipped with the extended-span and chord F-40 wing. 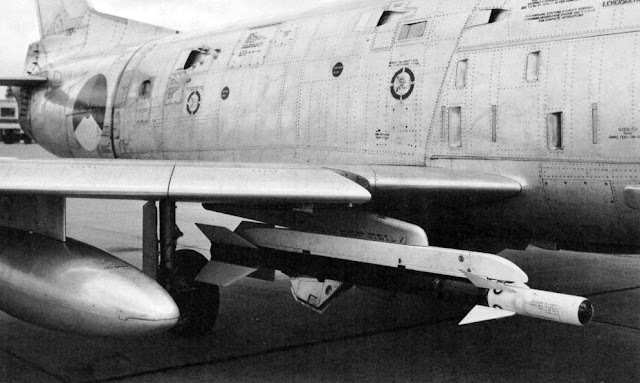 Later most of the early produced F-86Ks were retrofitted with the F-40 wing. 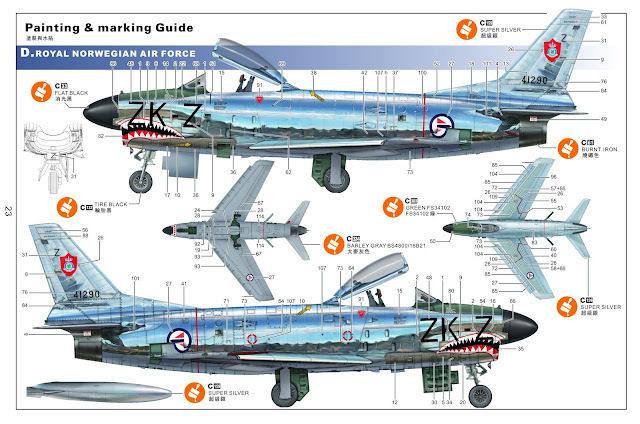 So that is enough history of the kit – let’s look at Kittyhawk’s new model – follow up to the “D” model the F-86K in 32nd scale. 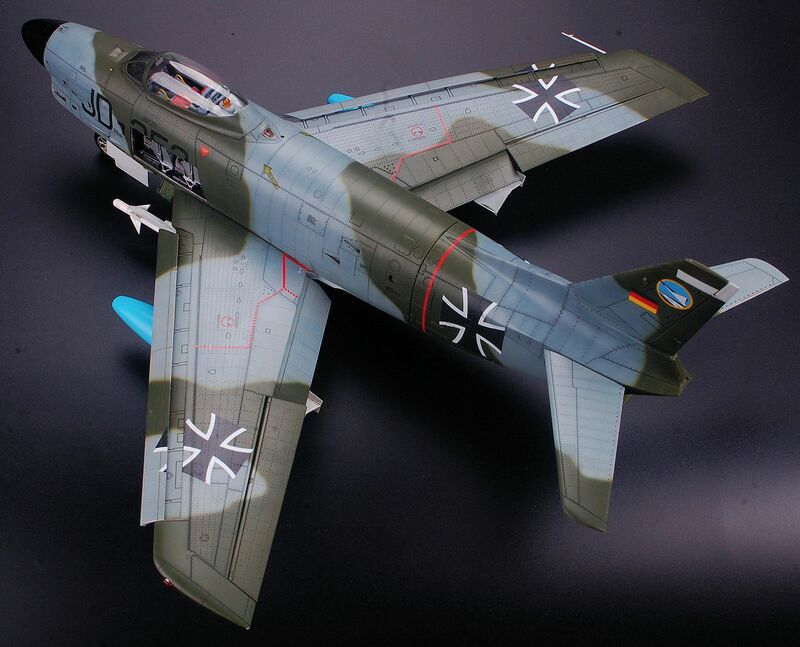 This is a smaller box than many other 32nd scale kits of an aircraft of compatible size. It actually is quite surprising to see. A nice thing I saw was that the sprues are all individually packaged in clear to protect from scrapes to that surface detail we all treasure. Also the clear sprue was delivered in a strong little box to prevent damage to those brittle plastic parts. The instruction booklet is a small A3 size that pack twenty-three pages with twenty-three steps that are sometime broken down into two or three assemblies for each step. These are black and white and they are fairly simple in their look and feel. I like this as it isn’t too busy with detail and supplies just the fitting points without too much to distract your decision making process when gluing this together. Two things that i was tipped off by our builder here Nic who has made the "D" model. One is the airbrake arm angle needs to be slightly corrected - If you build it out of the box, the speed brakes stay aligned with the fuselage. Photos show that when they are open, they are positioned downwards. Fortunately, it’s an easy fix: just cut the opening for the speed brake arms at the right angle below and glue a plastic triangle cut plasticard above. While test fitting, Nic noticed that the kit had a tendency to drop on its tail. Just to make sure, he glued a couple of left-over Ikea bolts in the nose. The plastic is nicely moulded with minimal flash so nothing really bad to report, however there were two things I noticed straight away about this kit. The first Is the attachment parts. A lot of the points where the plastic of the sprue meets the model are not joining on the visible surfaces. Several points of injection will never be seen after you cut them off. As an example the centre seam of the model is joined to the sprue off the centre fuselage so you need not risk cutting chunks out of your kit if you are a little hasty with the knife and snips. Sensible moulding like this is becoming more common but it’s great to see Kittyhawk doing this. It speeds up the construction and it takes some of the but-hurt out of making a kit that you probably will model in natural metal finish. The second thing I have noticed is the surface texture. The duplication of an aircraft’s skin is so important to modellers. Kittyhawk has impressed me with their approach to this kit as you will see in some of the pictures in this review of the small rivet texture and panel lines. They are not at the point of replicating stressed skin as of yet but this is almost as good. The scale effect of this refined textures that replicate the lumps, bumps and rivets looks great on this model. Lastly I might mention that the real difference on this kit to the “D” model is the two new A and C sprues to suit this “K” model. Now let's look at the box contents, Instructions and markings, then compare them with the real thing. The clear sprue comes in a sturdy box as we have already seen. This houses on runner with a very clear canopy front and back. This bubble canopy does not have a seam down the middle and that is great for those wary of having to sand the seams out themselves. This sure is little – but all we need is on there as too much PE is just annoying – ask Pele! The parts we have here are for the harnesses on the ejection seat while there are some delicate inside parts for the insides of the airbrakes which have a tiny fold to grab on. Bring some thin super glue for all of these bits. Sprue A: the extended wings of the "K" model. 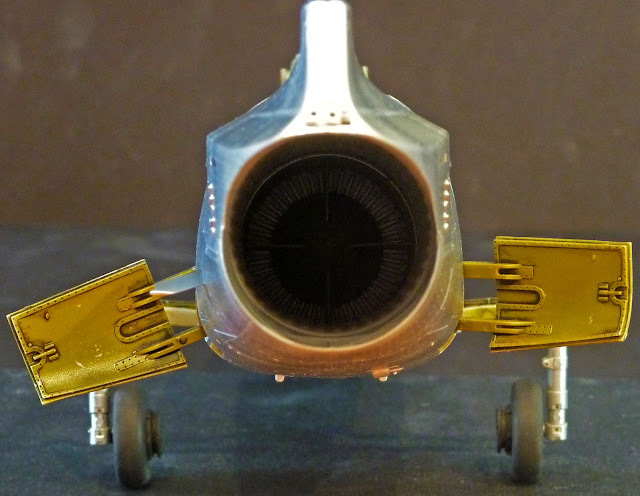 These wings have the right angle and lengthened wingtips to match your “K” model Sabre Dog. The slats are one part of the seven pieces that make up the main construction of each wing (on sprue B). The surfaces are all posable but check your references to see just how they move on the real thing once on the ground or in the air – however you want to show them on your kit. 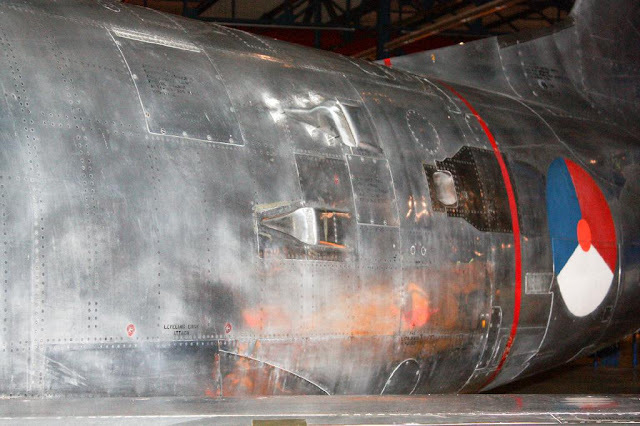 ...And the undersides are detailed just as well as the upper surfaces. Sprue B – Wing’s moving surfaces. Sprue C: fuselage, cannon and inserts. This is a large sprue and one that catches your attention immediately out of the box. 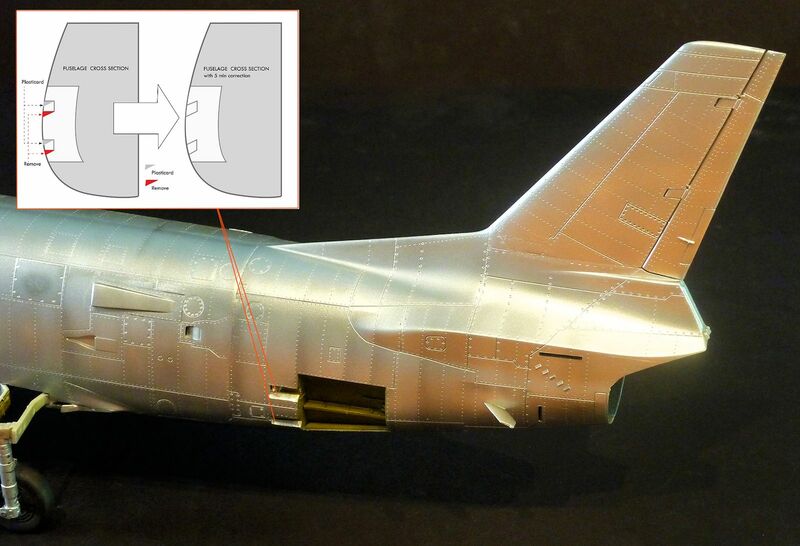 The large side fuselage halves and the front and rear undersides of the skin of the aircraft dominate this sprue. Look along the sprue and you will see more of that impressive subtle riveting, panel lines and even different surface texture moulded on. You can see the nice angle replicated of the intake along the front fuselage and the panel and rivet detail again moulded into the plastic. The vented underside of the nose fuselage behind the tail wheel shows the faired-over place where the rocket pod tray goes on the “D” model Sabre Dog. The rear under-fuselage...notice the different surface texture on this part on the right hand side. Because the “K” model Sabre was armed with the 20-mm M-24A1 cannon with 132 rounds per gun these are included on this sprue. The barrels are not hollowed out and unless you open the port up (the option is there with this kit) you will not see the ends of the guns. The well detailed interiors of the gun bays are put together just like a box which gives the injection-moulder more option for detail. The Sabre “K’s” General Electric J47 engine is the main focus of this sprue of over forty parts. It can be constructed as an exposed engine if you like. I also think by looking at the steps of the instructions it could be left out altogether. It may save some time as long as the kit doesn’t turn out hollow like the many aircraft you see in museums that have their engines removed. The many parts of this engine make it a tempting proposition to remove from the model and either display it or skip it and get onto the next bit. You see here the rear bulkhead of the engine on the right and the front spoked or slotted (your choice) wheels with the front gear. Sprue E, Engine, intake and cockpit. 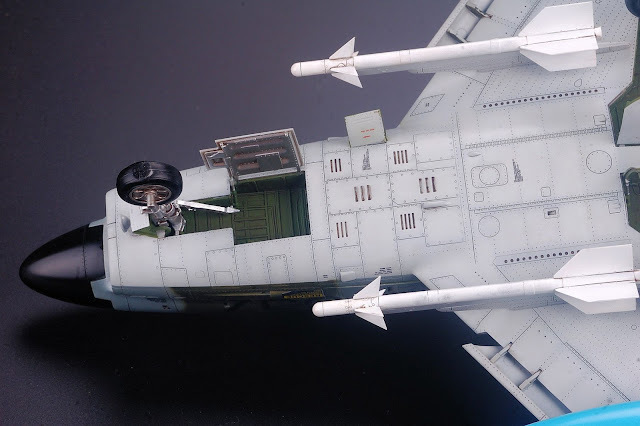 This sprue has many of the internal features of the kit including a ten-part ejector seat. This, and the cockpit panels and instrument panel are all here on the one sprue so no searching around to find stuff. I like this on a model. The internal tub of the cockpit is all centrally located on sprue E with raised detail on the cockpit side panels, padded rests for the ejector seat which is also very good looking and not in need of replacement in my view. There are also the airbrakes, the pointed down intake spear halves and the cone and the dome of the APG-37 nose radar along with other detail including the turbine fan blades and other extra parts for the engine. This is another large and attention getting sprue, It houses the rear tail section with the “K” tail-chute which looks different to the “D” model. Both halves of the vertical and horizontal tails are here also. 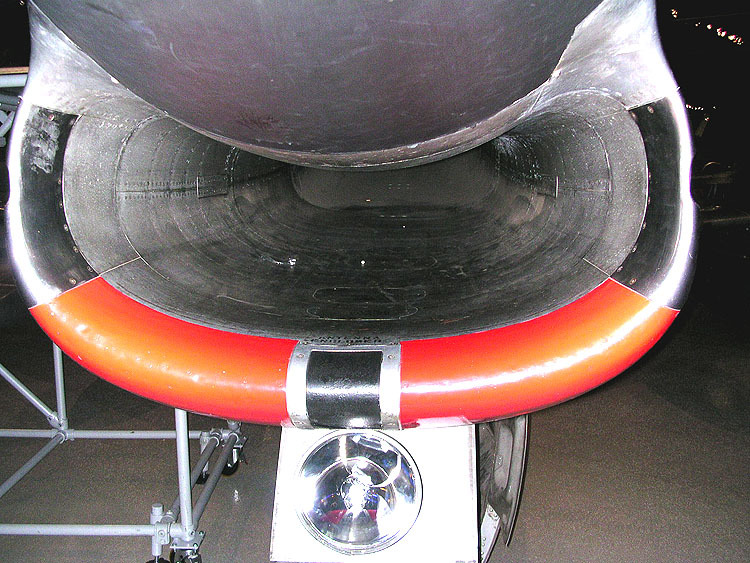 The intake part that makes part of the mount for the box that the front nose wheel is anchored into is in the upper part of this picture – right next to it is the curved central part of the air intake. Speaking of air intake this is a most important part of the airframe to get right – here is the Kittyhawk mouth right next to a reference “K” airframe – not bad..
Also the tail is something that impressed me. This can be removed but I think there might have been a plan at one time to have this maybe able to be taken on and off and that was dropped I am not sure. 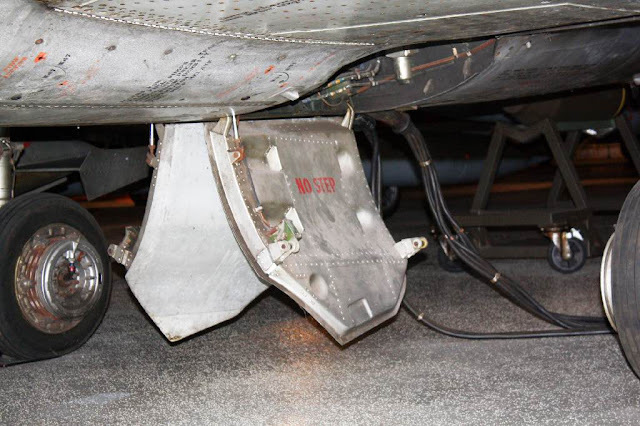 The several vortex generators are moulded onto these tails which saves any fiddling with gluing them on later or using PE parts. Sprue G: rear wheels and ordinance. This is another large but mostly flat sprue filled with Aim 9B sidewinders, drop tanks and rear main gear and their associated bays to house them.The rear wheel wells are packed with detail because they are made like a box and the moulders can add more detail. The frame of these boxes also anchor the wings to the fuselage. The rear main wheels have the thick brakes at their centre the spoked hubs also like the real things. Also the stubby gear doors are here. 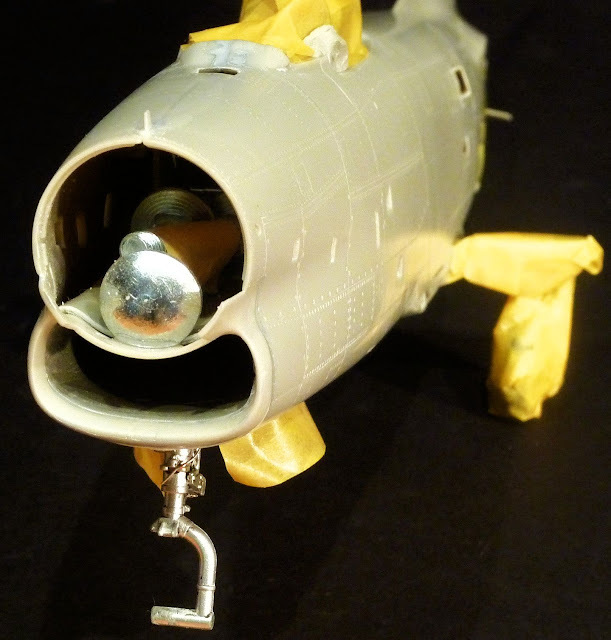 A pair of drop tanks are included with this kit and their interesting fins at the tips are also present on this sprue. Filler holes are pretty pronounced you will not miss these. The aim-9B sidewinders that some NATO aircraft carried are here. What was nice about these was that their fins that glue on are almost see through. Very thin indeed and maybe a reason not to use photo etch for scale thickness. There are the five schemes slated for this boxing's release - very nicely chosen with some thought for different skillsets and contrast of colours. They are from a variety of the NATO export countries and branches of service - this should get a lot of people worldwide interested and it is a smart move. 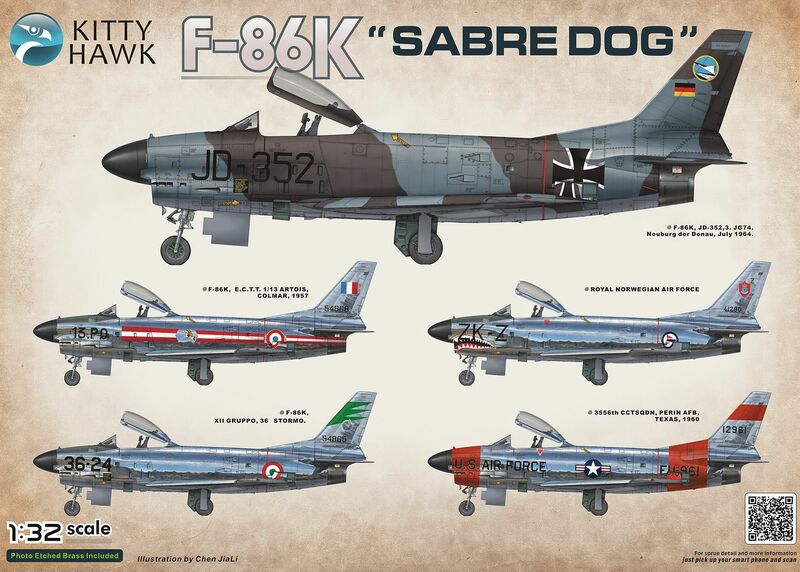 for the US market - the biggest in the world a USAF Sabre Dog is also included. The profiles are sewn into the book – one of them has a fold-out aspect to them so you can see a little more detail and some are a simple one-page affair – these are the aircraft together with the real things caught in history for you to compare and contrast with the decals and profiles supplied. A French aircraft is included as one of the five choices of schemes in this kit.This Armee de l'Air North American (Fiat- built) F-86K Serial: 13.PQ (55-4868) from the E.C.T.T. 1/13, Colmar in 1957. This ex-Italian Air Force aircraft is presented in an attractive scheme that is unusual for the F-86K model in that the French only received 62 Fiat built Sabre dogs from 1956 to 1957. 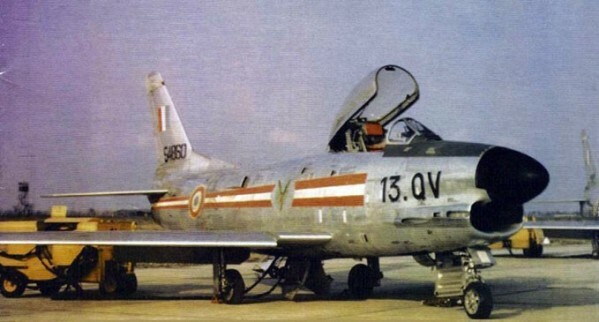 This aircraft flew with the Escadron de Chasse Tout Temps (All-Weather Fighter Squadron) 2/13 "Alpes" from Colmar-Meyenheim Airbase (in the Alsace region) from 1957 to 1959. Speaking of the Italians - The Italian Air Force is included as well with an F-86K from XII Gruppo/36° Stormo. Fiat produced 121 F-86Ks for Italy between 1955 and 1958. 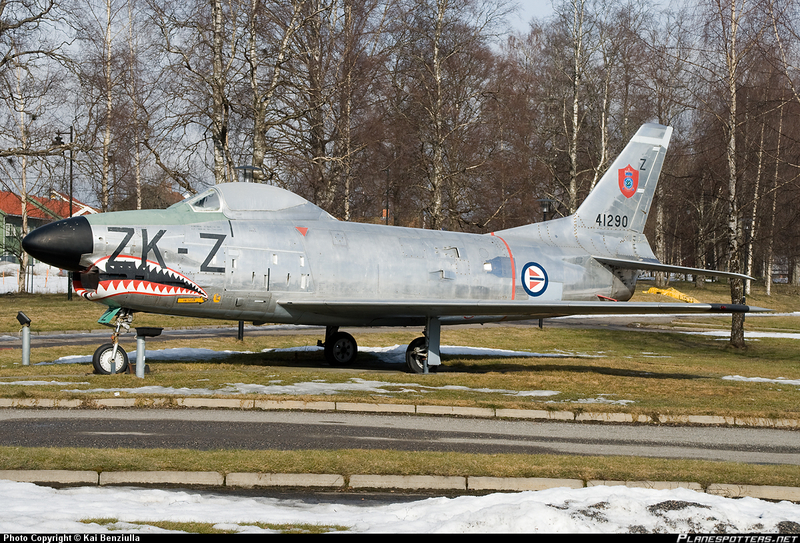 They also acquired 120 U.S. build Sabre dog K models. 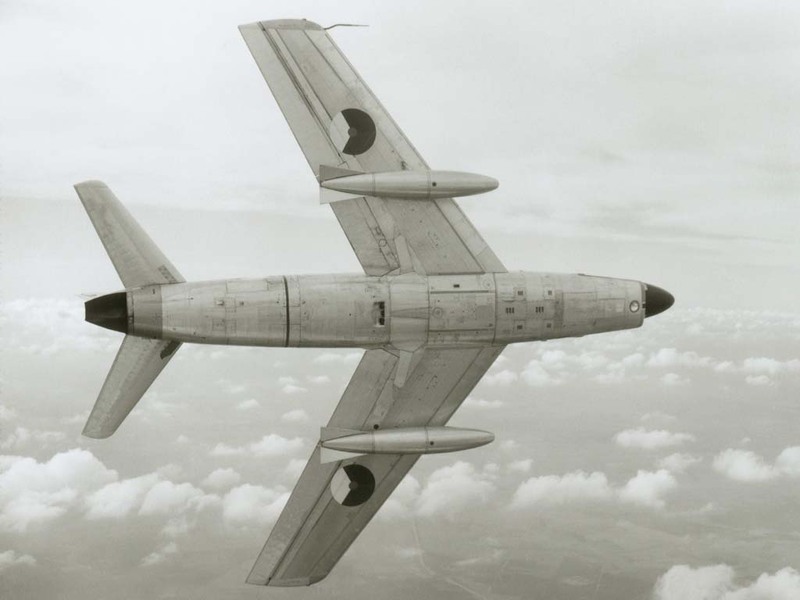 This aircraft was captured in a picture of the aircraft later in its career in Malta at an RAF base. Check the comparison on the profile drawings these are well researched. 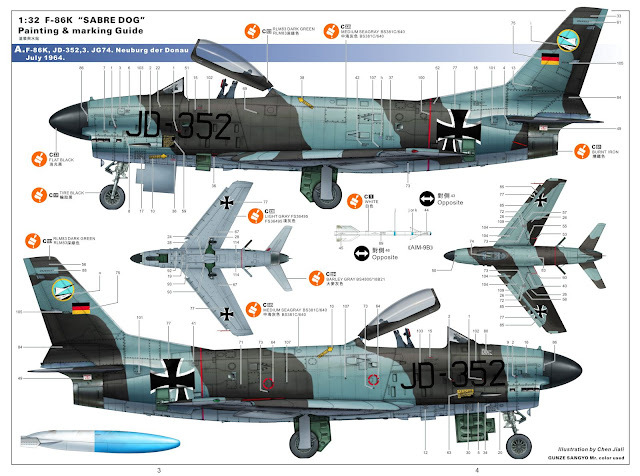 A nice looking Luftwaffe version of Jagdgeschwader 74 is included in the decals and the box art this F-86K with the number “JD-352” (C/N: 165, S/N: 54925) from 3, JG 74, stationed at Neuburg der Donau, in 1964. 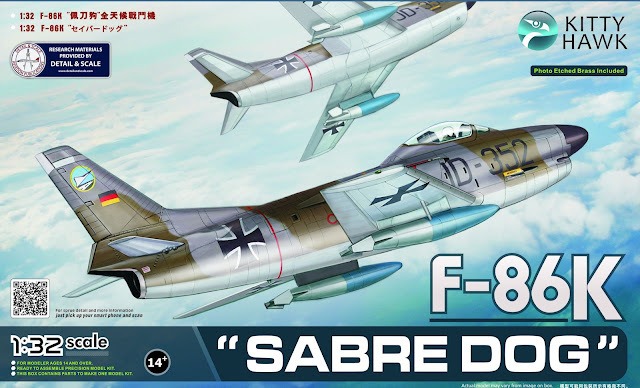 This is the box art cover star, which operated the F-86K in Neuburg through the mid-sixties and this will no doubt be a popular colour scheme. 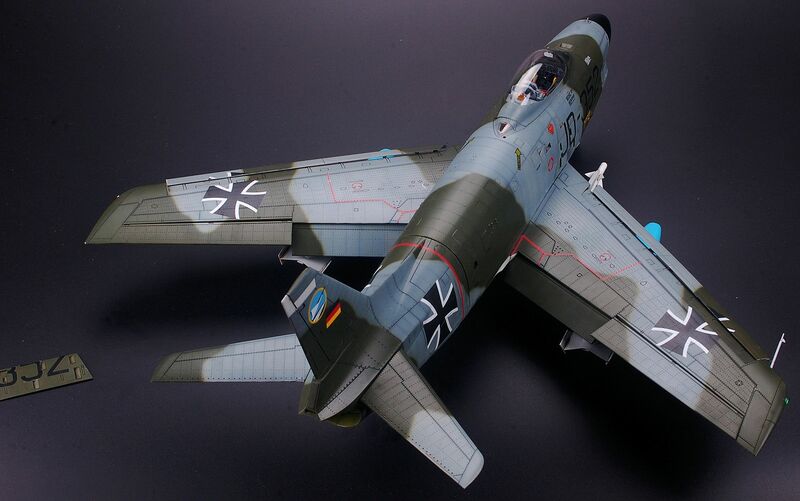 It would be easy I suppose to convert this into another Luftwaffe Sabre dog with little additions by yourself. The fact that this is a camouflaged version also is good for those who are shy of natural metal finishes on their models. 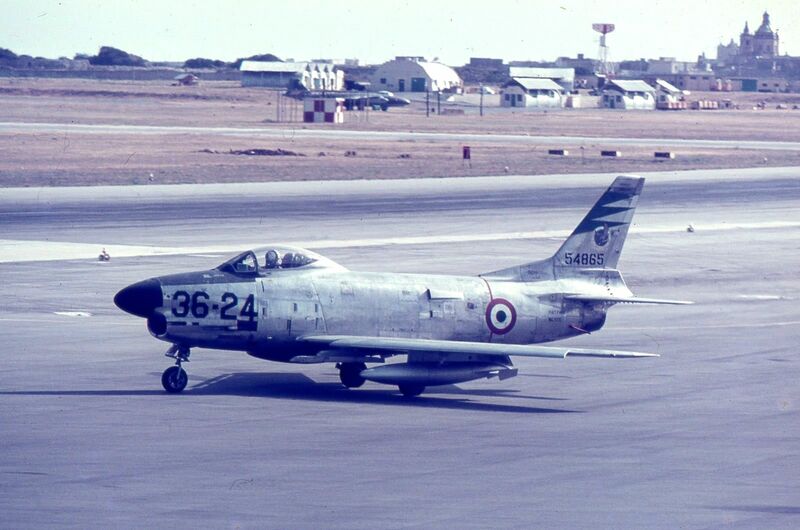 Here is JD-352 back in the sixties..
F-86L-20-NA – Serial no FU-961 from 3556th CCT Sqdn. 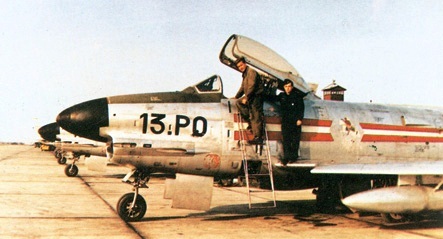 at Perrin AFB in Texas in 1960. 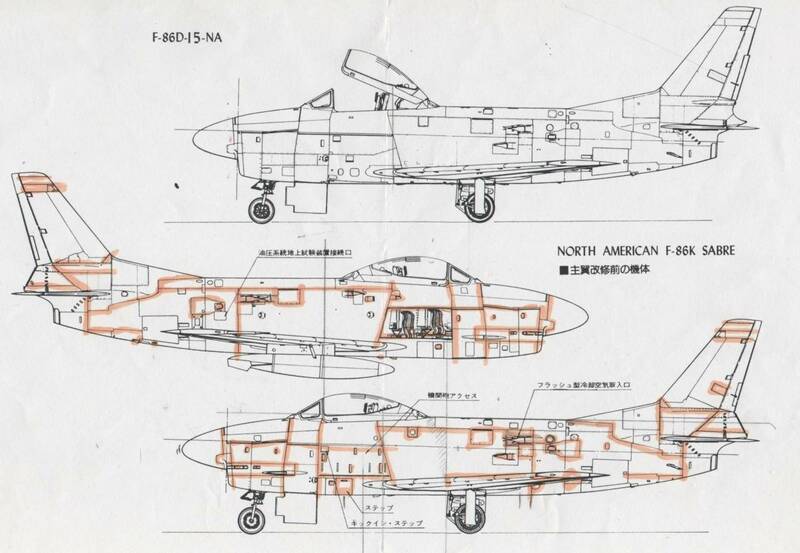 The F-86L was an upgraded conversion of F-86D with new electronics, extended wingtips and wing leading edges, revised cockpit layout, and uprated engine. This aircraft appears to actually be an ex F-86D-20-NA that has been converted to an “L” standard. You will notice the barley white colour underneath the aircraft which is really odd and it will give you a different looking aircraft rather than the all-over natural metal finish of most all of the Sabres out there. 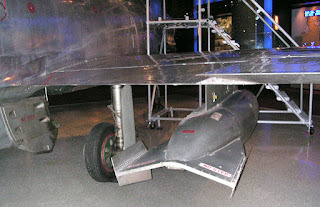 Proof that this aircraft was a “D” or “L” model – NAR “Mighty Mouse” folding fin rocket unit under the forward fuselage lowered. 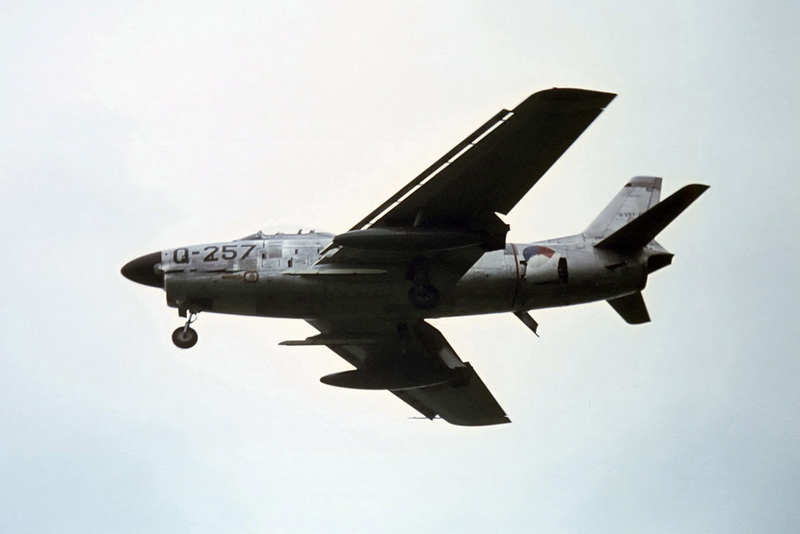 Also noted from this picture below you may have to mask the natural metal around the "Fu-" on the tail and the end letters of the "orce" on the dayglo parts of the aircraft. 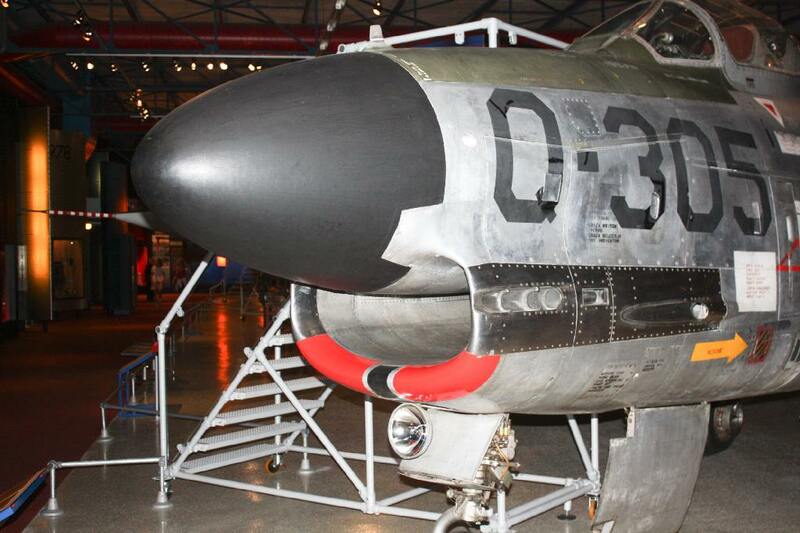 Also was the vertical tail a black band? 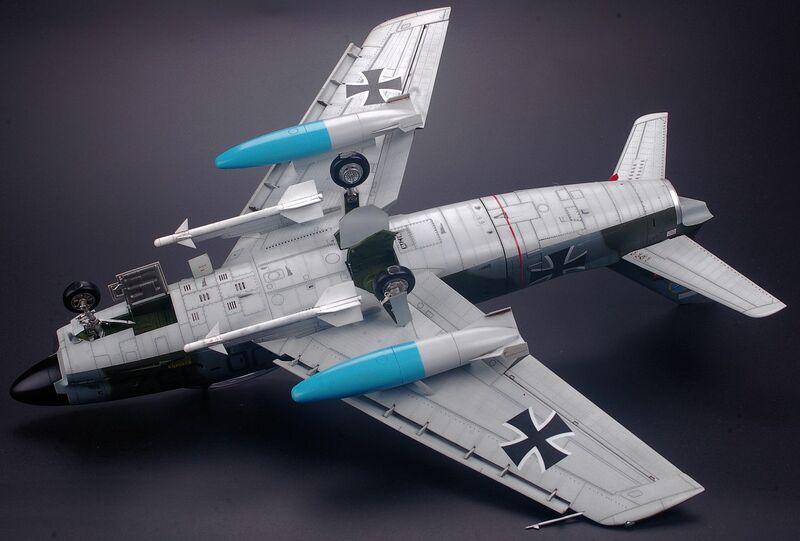 Kind of frustrating to me 'cos i like this scheme the most..
You can make this version if you replicate the under fuselage skin or the whole rocket tray that came with the “D/L” model kit if your buddy with a "D" kit wants to swap his. You will have to do some fairing filling and maybe alter the cannon ports as well. It is possible but difficult. 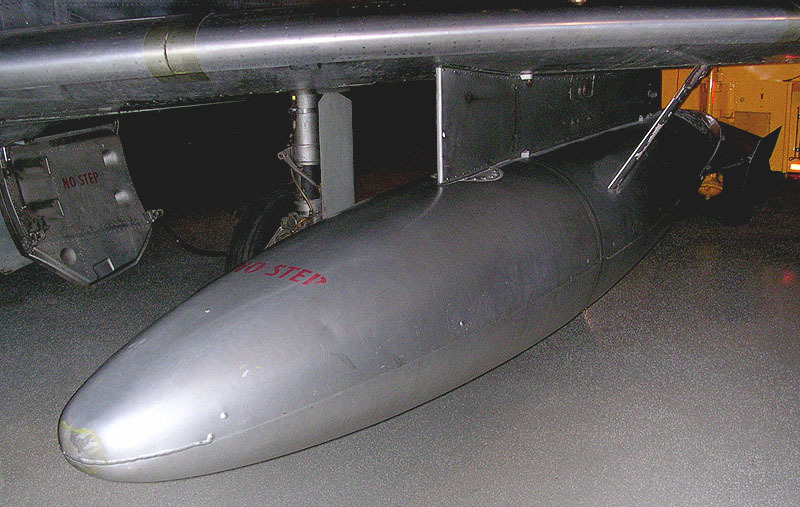 The kit already has the correct wings and tail ‘chute assembly fairing for this aircraft. The Royal Norwegian Air Force version is here also. 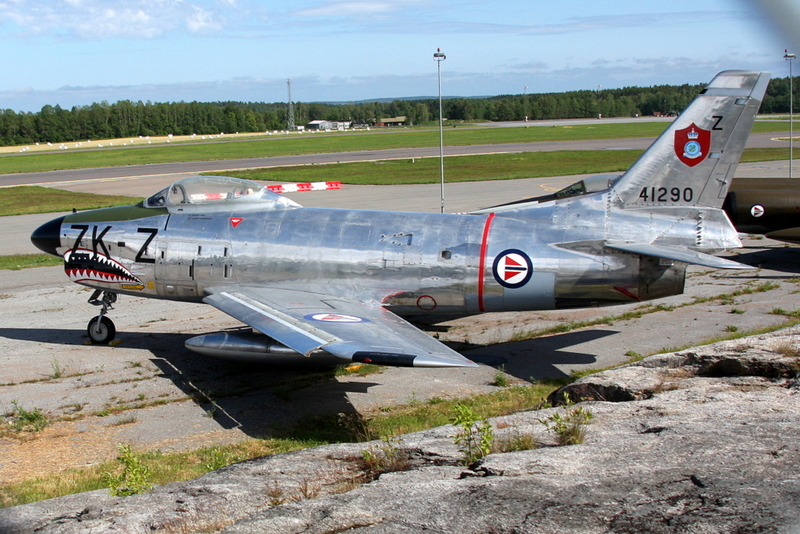 The Norwegians received sixty U.S.-built F-86K Sabres in1955–1956, they also added four Italian-assembled Fiat K-models. This shark mouth version was a Fiat-built F-86K ZK-Z Royal Norwegian Air Force #41290 that is now a Gate Guard of Forsvarets Flygsamling near Oslo Gardermoen airport. Printed on two sheets these decals are fairly large in their scope. They house several large national and unit specific markings which will need some decal setting solution with their handling and securing tight to the skin. The decals are very thin and of a matte like finish. The carrier film is really very minimal and noticeably so, I like this although it will not be enough for some people who cut out the decals in these larger scales. It’s a great start though. National markings are provided for all nations but stencilling is there just for one machine as you would expect. Here on the second decal sheet you can see the unit and side instrument panel decals for this aircraft. I really do not know if these decals will snuggle down as much as you would on the bumpy instrument panel bezels. A (1/1 scale) 1 penny coin next to these decals shows the size and detail of the sharp printing. Well that is all that's in this box! There is a lot in there but the construction is ordered (and the parts grouped together where they can be) to make for a simple and quick construction. 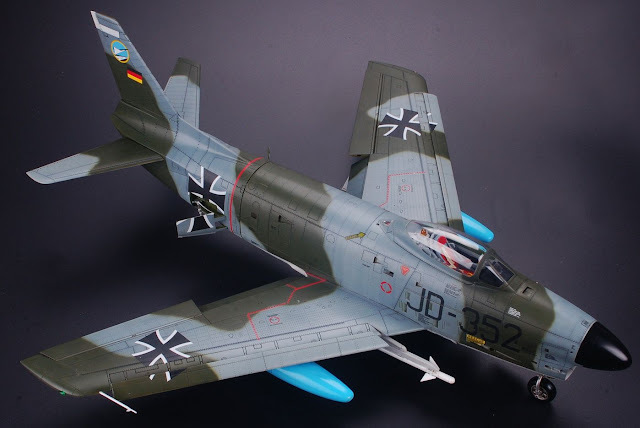 If you use this review and Nic's build of the F-86D that we included on the top of this page you could do just as good a job on your own 32nd scale "Kilo" sabre Dog. Well done to Kittyhawk for improving as they go - these Sabres are their best models yet so let's hope this improvement keeps on going. The sky IS the limit. This kit will be available from KittyHawk’s Distributors and thanks to them for sending this kit to us to review.